With promises of a big discovery about to be announced by the Curiosity team, we thought it was time for another look at the best of Curiosity’s pictures – of itself. “We’re getting data from SAM,” lead investigator John Grotzinger recently told NPR referring to the Sample Analysis at Mars instrument suite aboard Curiosity. “This data is gonna be one for the history books. It’s looking really good.” Although a JPL spokesman tried to dampen expectations, raised by Grotzinger’s enthused statement, that the probe may have found signs of Martian life, we can all look forward to a couple weeks of buzz – and pictures – before we finally find out. 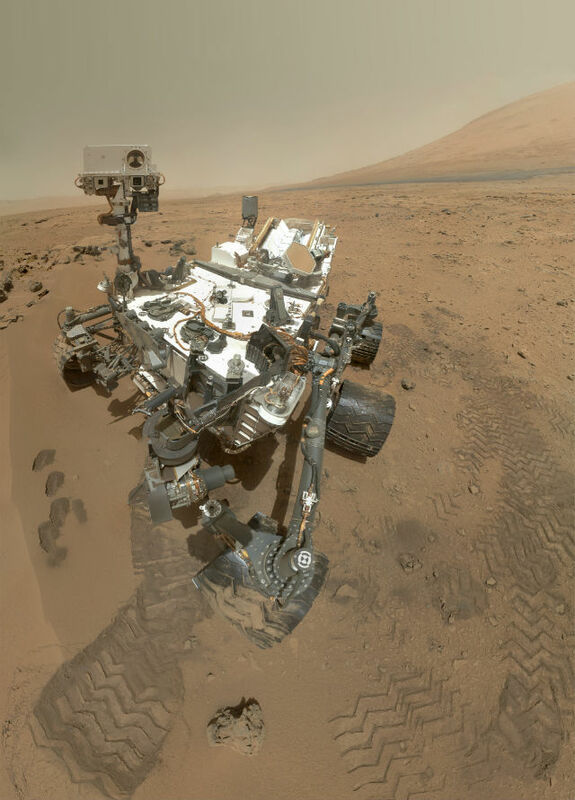 A stunning self-portrait of the Curiosity rover (Credits: NASA). On Sol 84 (Oct. 31, 2012), NASA’s Curiosity rover used the Mars Hand Lens Imager (MAHLI) to capture this set of 55 high-resolution images, which were stitched together to create this full-color self-portrait. The mosaic shows the rover at “Rocknest,” the spot in Gale Crater where the mission’s first scoop sampling took place. Four scoop scars can be seen in the regolith in front of the rover. The base of Gale Crater’s 3-mile-high (5-kilometer) sedimentary mountain, Mount Sharp, rises on the right side of the frame. Mountains in the background to the left are the northern wall of Gale Crater. The Martian landscape appears inverted within the round, reflective ChemCam instrument at the top of the rover’s mast. Self-portraits like this one document the state of the rover and allow mission engineers to track changes over time, such as dust accumulation and wheel wear. Due to its location on the end of the robotic arm, only MAHLI (among the rover’s 17 cameras) is able to image some parts of the craft, including the port-side wheels. This high-resolution mosaic is a more detailed version of the low-resolution version created with thumbnail images, at PIA16238. JPL manages the Mars Science Laboratory/Curiosity for NASA’s Science Mission Directorate in Washington. The rover was designed, developed and assembled at JPL, a division of the California Institute of Technology in Pasadena. For more about NASA’s Curiosity mission, visit: http://www.jpl.nasa.gov/msl, http://www.nasa.gov/mars, andhttp://mars.jpl.nasa.gov/msl.